I started to explore how Teff flours worked in baking (in a high inclusion) and how to combine it with which flours and I discovered through reading recipes online and comparing teff to quinoa (they bake similarly) that if you use half teff and half almond flour it works amazingly well. The texture is very smooth and it binds so well. Teff needs moisture and almond flour is the binding agent here. So the PRO tip here is substitute the flour in your recipes using ½ teff flour and ½ almond flour. This cake only gets better with time! Feel free to serve the cake with cranberry sauce or even Lingonberry jam from IKEA! Preheat the oven to 340˚F, and generously butter a 9x5-inch loaf pan + 1 small one. Whisk (or sift) together the flours, baking powder, baking soda, spices, and salt in a medium bowl. In a large bowl, whisk together the sweeteners, olive oil, pumpkin purée, and eggs. Add the dry ingredients to the bowl with the wet ingredients and whisk until just combined (adding the dry ingredients to the wet ingredients helps to prevent little dry pockets in the bottom of the bowl). Fold in the chopped chocolate or nuts. Pour the batter into the prepared pans and bake for 75 to 90 minutes, or until a skewer inserted in the center of the cake comes out clean. 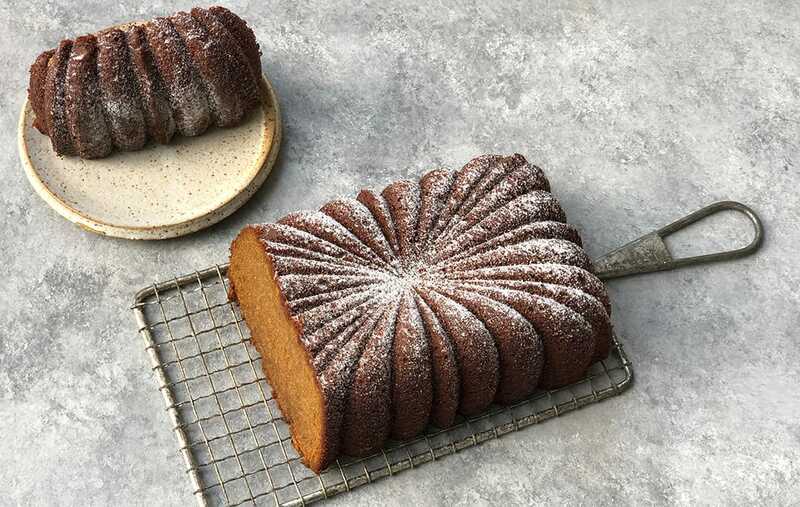 Let the cake cool in its pan on a wire rack for 20 minutes. Run an icing spatula or a thin knife carefully around the edges, and invert the cake from the pan. Re-invert the cake so that it is right-side-up and let cool on the rack for another 20 minutes. Transfer to a serving plate. You can make your own squash purée: Remove the seeds from a 1-pound piece of kabocha squash and drizzle the squash with olive oil. Place squash cut-side down on a baking sheet and roast in a preheated 425˚F oven for 30-45 minutes, until the squash is very soft and beginning to caramelize around the edges. Remove from the oven and let cool. Scrape out the soft flesh into the bowl of a food processor, and pulse until smooth. Place the puréed squash on a large square of cheesecloth, and wrap into a tight bundle. Put the bundle into a colander, and place over a large bowl. Let drain at least 4 hours, or up to overnight. Twist the top of the bundle to squeeze out any additional liquid. Unwrap the drained squash, and measure out 1 cup of purée for the cake recipe. Cover and refrigerate any remaining purée for another use (may be stored for up to 5 days).